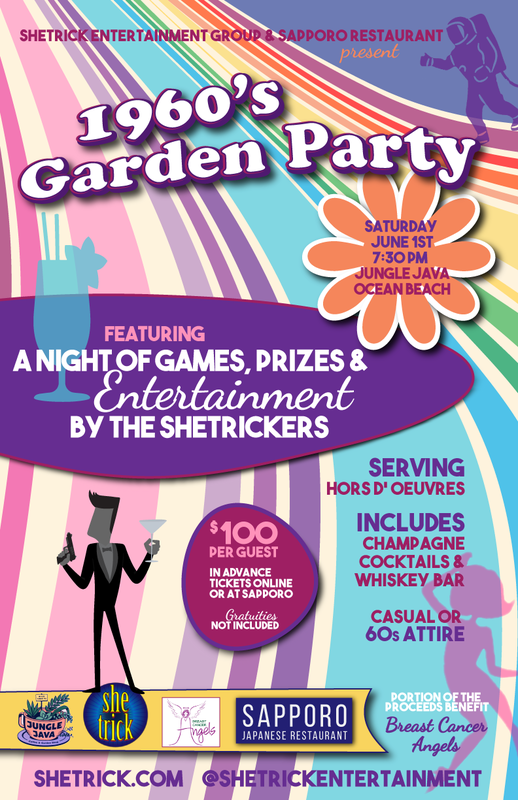 Get your tickets now for our 1960's Inspired Garden Cocktail Party featuring Shetrick Entertainers, Premium & Signature Cocktails and Hors D’oeuvres from Sapporo. Enjoy Games with Prizes, Live Dancing & Singing Performances while avoiding the crowds at a private event in our beautiful outdoor venue, Jungle Java on Newport Ave in OB. Guest are encouraged not to drive. A portion of the proceeds goes to our charity, Breast Cancer Angels. Help support local artists while having a great time in an exclusive environment. Tickets are $100 per person (+online fee) & available below or buy your tickets in person at Sapporo. ​Extremely Limited Tickets Available. This event will sell-out in advance. BUY NOW! SheTrick Entertainment & the reality-blurring story of "From Dusk till Dawn"
SheTrick Entertainment does much more than immersive theater. We host parties, supply actors and performers for special events. We offer unique event planning and production services. If you need to take your event to another level, call us!